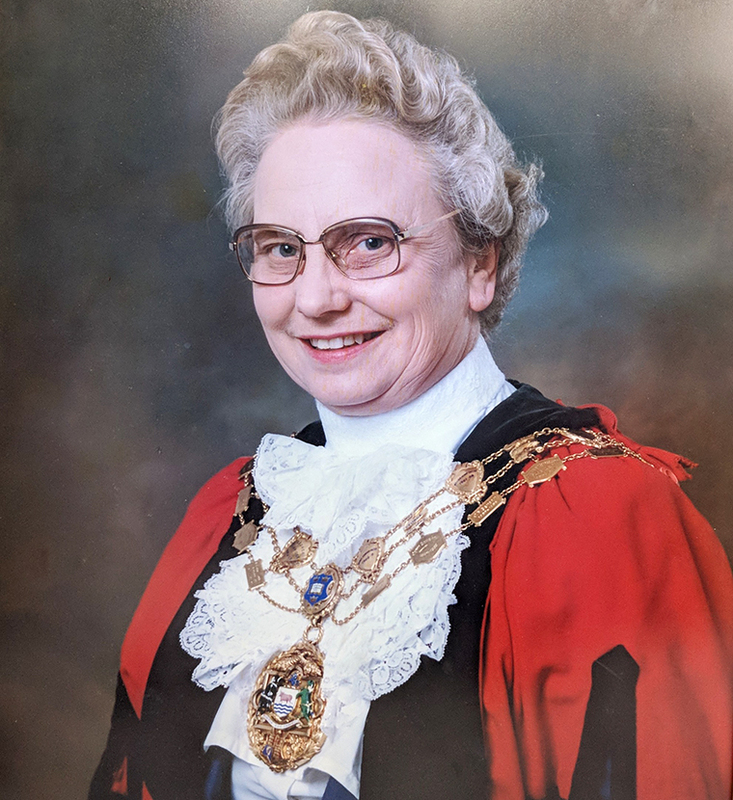 Mrs Queenie Comfort, a former councillor and Mayor of Ferndown and of Pringles Drive, Ferndown passed away in December. Queenie Comfort died suddenly at The Horton Hospital, Banbury from heart failure on 13 December 2017. She was 88 years old. Queenie was born on 3 November, 1929 in Bournemouth and was christened Nellie Dorothy Allen. But she was affectionately known as “Queenie” from childhood. Due to her mother’s ill health and subsequent early death she was raised in Bournemouth by her grandparents. She was awarded a scholarship to a private school during the war years. Queenie went on to attend a teachers’ training college and when qualified took up a post at Pinelands Preparatory School in Bournemouth. She met and married Roy David Whorley (known as John) in 1953 and they had one child born in 1955, David Charles Whorley. In 1963 the family moved to Basingstoke where she was a full-time teacher at Coombehurst Preparatory School and later to Oxford, where she helped in the family business. It was at this time she got involved in local politics; firstly within the local chamber of commerce leading to later becoming a city and county councillor. After many years’ service she became Sheriff of Oxford in 1987 and Lord Mayor of Oxford in 1988. In the early 1990s she was divorced and married John Bailey Comfort. In 1994 they moved to Ferndown Dorset where, sadly, in 1996 her second husband died. Queenie rekindled her interest in local politics and was elected as a town councillor and served for nearly 20 years. She became a mayor for the second time in Ferndown from 2009-10. On top of her busy diary, she actively supported a number of charities including the local Age UK branch and assisted at The Barrington Centre, where she was on the committee. By 2014 her health was starting to deteriorate. She briefly lived with her son in Banbury before needing full-time care in a nursing home where on 13 December 2017, she was taken ill and died shortly afterwards at The Horton Hospital, Banbury from heart failure. She is survived by her son David and grandchildren and extended family. Queenie’s funeral will take place on 16 January at the Broughton Church of St Mary, near Banbury OX15 5EF at 11.50am and then at the Banbury Crematorium for 1pm. Flowers, which Queenie was very fond of, may be sent to to Edd Frost Funeral Directors, Banbury OX16 9HR. All who knew her are welcome to both ceremonies. If you would like to attend, please contact the Funeral Directors, or her family on 01235 814658.